Season One Summary: When the evil Lady Kale finds a dark jewel, shes uses it in an attempt to gain control of the Crown Jewels of Avalon – seven mystic stones which bind the magic of the kingdom to good. When the good Wizard Merlin refuses to give her the key to the jewel box in which the Crown Jewels are stored and scatters the jewels all across Avalon, Kale uses her Dark Stone to cast him into the Wild Magic . Merlin’s students – known as the Jewel Riders – must search for the lost Crown Jewels in a race against Lady Kale to determine who will control the magic of Avalon. To read the scripts from Season One, visit our Season One Scripts page! Avalon is a magical kingdom controlled by Merlin for the good of all. But the outlaw, Lady Kale, has imprisoned Merlin by capturing the Dark Stone, harnessing its evil magic. To stop her, Merlin gives the magic key to his Jewel Box to flying unicorn named Sunstar, telling her to take it to New Camelot. Sunstar is captured by Kale and taken to her castle in the Thornwoods. Before Kale can steal the Seven Crown Jewels to rule Avalon forever, Merlin scatters them throughout the land. Only the Jewel Riders, a heroic band of youngsters and forest animals led by Princess Gwenevere, can recover the lost magic jewels and save Avalon from the clutches of Lady Kale. The wild magic in the kingdom has made it dangerous to ride the Travel Trees. Gwen and her flying unicorn, Sunstar, become lost searching for the Crown Jewel of the Northwoods. The other Jewel Riders rush to find her and discover the evil Lady Kale has stolen the Jewel. To save the Northwoods, they must defeat her. While performing at a Craft Fair, Tamara is enchanted by the magic music of a harp. 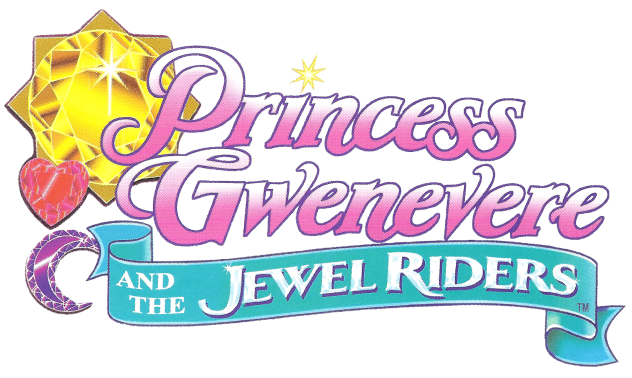 Following its call, she leads the Jewel Riders and Kale to Rainbow Falls – and the missing Rainbow Jewel! Can Tamara’s music repair the broken Rainbow Jewel, or will she be lost to the Wild Magic? Gwen and Drake ride to the old mountain called Wizard’s Peak. Inside, they find a giant secret room and the precious Crown Jewel of Burning Ice. But they wake up a mighty guardian of the wizards’ treasure. When Gwen and Drake disappear after fighting for the Jewel, Tamara the the other riders must come to their rescue. Deep inside the Misty Moors, Drake, Josh and Max are turned into frogs by a troll who has discovered the wild magic of the Misty Rose Crown Jewel. The Jewel Riders must reach the boys before the mischievous little troll can turn them into frog stew. Tamara cooks up a plan to get everyone out of hot water and find the stone. Faery Wisp, the tiny princess of the garden world of Faeryland, has lost her way home and asks the Jewel Riders for help. Feeling wild magic in the air, they lead her back to her kingdom and the Desert Star Crown Jewel. But Lady Kale is waiting. It will take all the magic of the Jewel Riders to return goodness to Faeryland. While escorting a caravan through Wizard’s Pass on the way to a naming-day ceremony at Castle Greenwood, Fallon and the Jewel Riders encounter Alfred and Wynerva, Fallon’s parents who never approved of her becoming a Jewel Rider. Meanwhile, Lady Kale teams up with outlaws to try and trap the caravan and get Merlin’s Key from Princess Gwenevere! It will take all of Fallon’s magic to save her parents and get the caravan safely to its destination. Tamara and the Jewel Riders are summoned back to Heartland Farm by her parents Doc and Charity after they discover a rare Prism Fox and hope that their daughter’s Heart Stone can help them communicate. However, Lady Kale also wants the Prism Fox for its ability to ride the Wild Magic without a Jewel! In a musical battle between Kale and the Jewel Riders, who will play the last note? Drake pulls a greedy magic sword from a tree at a Craft Fair. With the sword as his coach, Drake tries some magic love poems out on Gwen, Fallon and Tamara, ending up with plans to take each of them to the dance that night! When the sword tries to steal the magic of the Enchanted Jewels, Drake has to call off his wedding to a pig in order to save Avalon. Gwen runs off into the Dreamfields of the Great Plains when she becomes bored with her date to a nearby party. In the Dreamfields, there is a Crown Jewel releasing dream magic. Gwen becomes caught in a battle of dreams with Kale who is also trying to find the Crown Jewel. In a wild dream, Kale switches Gwen’s Sun Stone with her Dark Stone and Gwen must rely on her friends to help her fight the nightmares of the Dark Stone. While the Jewel Riders try to find the last Crown Jewel and complete the magic of Merlin’s Jewel Box, Kale sneaks into the Jewel Keep at the Crystal Palace. Using other Enchanted Jewels found in the Keep, Kale constructs a dangerous device that releases anti-magic. When the Jewel Riders find the seventh Crown Jewel, Kale magically transports the Jewel to the Jewel Keep and into her hands. She then uses the anti-magic to destroy the magic of the Enchanted Jewels worn by the Jewel Riders. The Jewel Riders are helpless to stop Kale from taking over the Crystal Palace. The Jewel Riders must recharge the magic of their Enchanted Jewels by returning them to the Friendship Ring, the most magical place in Avalon. The girls must perform the Circle of Friendship Ceremony, as they did when they first got their jewels. With their jewels recharged, the girls must then enter the wild magic and find Merlin. Led by their friend, Kit the Prism Fox, and special creatures called magic gliders, the Jewel Riders find Merlin, but Kale has tracked them down. Merlin reveals that the Crystal Palace, itself, is an Enchanted Jewel with great powers of goodness. The Jewel Riders must release the magic of the Crystal Palace to save Avalon. While Merlin holds Kale in the Wild Magic, the girls use Merlin’s Jewel box to release the magic of the Crystal Palace and save Avalon. But Merlin has sacrificed his magic staff that holds his jewel to throw Kale into the wild magic and without this jewel, he cannot return home. The Jewel Riders discover that in accomplishing their quest, they are now tuned to the Jewel Box. This will give their jewels far greater magical power than they ever dreamed possible. They must now learn how to use these enhanced powers and continue their quest to bring Merlin home and protect Avalon. By turning the magic of the Jewel Box to themselves, the Jewel Riders have completed “Level 1” of their training. They are about to enter Level 2.